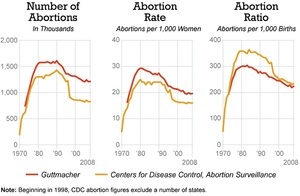 In the largest single-year drop since legalization, the Centers for Disease Control report the U.S. abortion rate dropped 5% in 2009, the latest year for which it has figures. The number of abortion clinics plummeted more in the 8 years when Bill Clinton was president than during any other 8-year period. Now the first year of Barack Obama’s term has offered another steep decline of another kind. But unlike that in the Clinton years, this decline can’t be attributed to relative economic prosperity; 2009 was the worst year of the Great Recession. There are many ideas on why the abortion rate fell. One is that grassroots pro-life people take more action when not relying on presidential lip service. In a similar dynamic, the peace movement held the largest world-wide peace demonstration ever under George W. Bush. It’s not nearly as active under the Obama administration. Yet with a kill list, weaponized drones, nuclear weapon “modernization,” the Guantanamo Bay prison still open and continuing wars, grassroots peace action is needed every bit as much under either administration, just as pro-life action is needed at all times. A CL Board member who participates regularly in a vigil at Planned Parenthood in Washington DC (a witness which encourages clients to consider choosing life and provides referrals to the counseling, housing, and medical and material assistance available from pregnancy help centers) was interviewed by British radio commentator Iain Dale (about 11 minutes into the broadcast) shortly before the election and had the chance to discuss the CL message as it relates to the US political climate. Opinions regarding specific candidates are those of the speaker, since CL doesn’t endorse candidates. But we have no problem pointing out that both major parties support state-sanctioned killing.